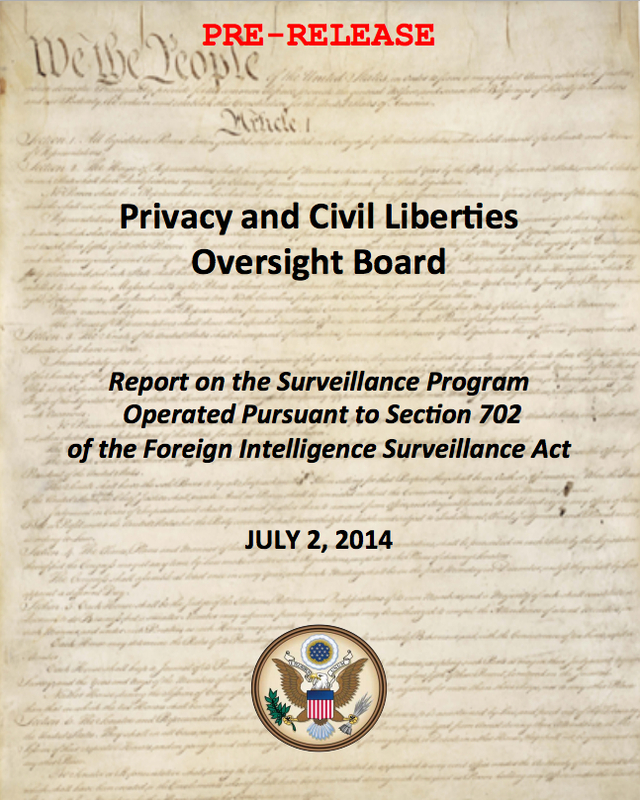 Short version: The board found little legally awry with surveillance conducted under Section 702 of FISA, which permits the federal government to compel United States companies to assist them in conducting surveillance targeting foreign people and entities, noting that it was a strong, effective tool for counterterrorism. The extensive report explores the legal rationales for such surveillance and lists ten recommendations in its report. The scope of digital surveillance was detailed in The Washington Post on Monday, which reported that only four countries in the world (the USA, Canada, UK, New Zealand and Australia) are not subject to the surveillance enabled by legal authority to intercept communications. The PCLOB did find that “certain aspects of the program’s implementation raise privacy concerns,” specifically the “scope of the incidental collection of U.S. persons’ communications” when intelligence analysts targeted other individuals or entities. But without signs of abuse, the board concludes privacy intrusions are justified in protecting against threats to the U.S. Nevertheless, the board suggests that the government take on the ‘backdoor searches’ that have alarmed Wyden. In those searches, the government searches through the content of communications collected while targeting foreigners for search terms associated with U.S. citizens and residents. The House voted in June to end such searches. The searches ‘push the program close to the line of constitutional reasonableness,’ the privacy board report says, but it doesn’t recommend ending them. Privacy and civil liberties advocates issued swift expressions of dismay about the constitutionality of the surveillance and questioned the strength of the recommendations. “The Board’s report is a tremendous disappointment,” said Nuala O’Connor, the president of the Center for Democracy and Technology, in a statement. “Even in the few instances where it recognizes the privacy implications of these programs, it provides little reassurance to all who care about digital civil liberties. The weak recommendations in the report offer no serious reform of government intrusions on the lives of individuals. It also offers scant support to the U.S. tech industry in its efforts to alleviate customer concerns about NSA surveillance, which continue to harm the industry in the global marketplace,” she added. “If the Board’s last report on the bulk collection of phone records was a bombshell, this one is a dud,” said Kevin Bankston, policy director of New America’s Open Technology Institute (OTI). “If the Board’s last report on the bulk collection of phone records was a bombshell, this one is a dud. The surveillance authority the Board examined in this report, Section 702 of 2008’s FISA Amendments Act, is in many ways much more worrisome than the bulk collection program. As the Board itself explains, that law has been used to authorize the NSA’s wiretapping of the entire Internet backbone, so that the NSA can scan untold numbers of our emails and other online messages for information about tens of thousands of targets that the NSA chooses without individualized court approval. Yet the reforms the Board recommends today regarding this awesome surveillance power are much weaker than those in their last report, and essentially boil down to suggesting that the government should do more and better paperwork and develop stricter internal protocols as a check against abuse. “As Chief Justice Roberts said just last week, “the Founders did not fight a revolution to gain the right to government agency protocols,” they fought to require search warrants that are based on probable cause and specifically identify who or what can be searched. Yet as we know from documents released earlier this week, government agents are searching through the data they’ve acquired through this surveillance authority–an authority that was sold to Congress as being targeted at people outside the US–tens of thousands of times a year without having to get a warrant first. “The fact that the Board has endorsed such warrantless rummaging through our communications, just weeks after the House of Representatives voted almost three to one to defund the NSA’s “backdoor” searches of Americans’ data, is a striking disappointment. The Board is supposed to be an independent watchdog that aggressively seeks to protect our privacy against government overreach, rather than undermining privacy by proposing reforms that are even weaker than those that a broad bipartisan majority of the House has already endorsed. Hiding behind the “complexity” of the technology, it gives short shrift to the very serious privacy concerns that the surveillance has rightly raised for millions of Americans. The board also deferred considering whether the surveillance infringed the privacy of many millions more foreigners abroad. “More bizarrely, one of the holdouts on the panel for calling for real reform is supposed to be a civil liberties advocate. The Center for Democracy and Technology’s vice president, James Dempsey, had the chance to side with two other, more liberal members on the four-person panel to recommend the FBI get court approval before rummaging through the NSA’s vast databases, but shamefully he didn’t. Editor’s note: This post has been substantially rewritten. More statements were added, and the headline has been amended. Earlier this afternoon, I emailed info@pclob.gov in search of the report that the New York Times and Washington Post had obtained and reported upon this morning. 2 hours later, I received a response: www.pclob.gov. There, visitors can now find, download and read a “Report on the Telephone Records Program Conducted under Section 215 of the USA PATRIOT Act and on the Operations of the Foreign Intelligence Surveillance Court” and separate statements by Elisebeth Collins Cook Rachel Brand. As Charlie Savage and Ellen Nakashima reported, Cook and Brand dissented from the report’s recommendation to end the collection of phone records under the 215 programs of the USA Patriot Act. The privacy and civil liberties board’s report is strongly critical of the impact that mass surveillance has upon the privacy and civil liberties of American citizens, along with billions of other people around the world. 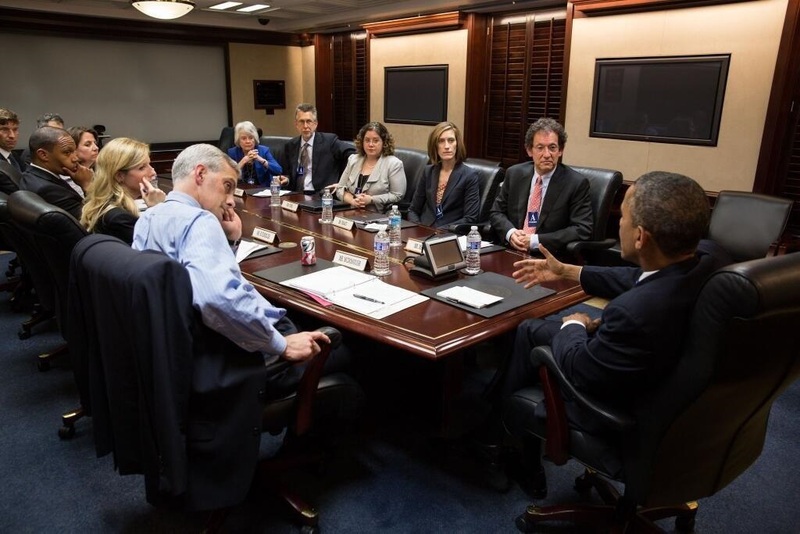 PCLOB Board Members meet with President Obama on June 21, 2013​. Photo by Pete Souza. While President Obama met with the board and heard their recommendations prior to his speech last week, his administration is disputing its legal analysis. House Intelligence Committee Chairman Mike Rogers (R-MI) was also critical of the report’s findings. “I am disappointed that three members of the Board decided to step well beyond their policy and oversight role and conducted a legal review of a program that has been thoroughly reviewed,” he said in a statement. The Electronic Frontier Foundation hailed the report as a vindication of its position on the consitutionality of the programs. Yesterday afternoon, the Office of the Director of National Intelligence began tumbling towards something resembling more transparency regarding the National Security Agency’s electronic surveillance programs. The new tumblog, “Intelligence Community on the Record,” is a collection of statements, declassified documents, congressional testimony by officials, speeches & media, interviews, fact sheets, details of oversight & legal compliance, and video. It’s a slick, slim new media vehicle, at least as compared to many government websites, although much of the content itself consists of redacted PDFs and images. (More on that later.) It’s unclear why ODNI chose Tumblr as its platform, though the lack of hosting costs, youthful user demographics and easy publishing have to have factored in. In the context of the global furor over electronic surveillance that began this summer when the Washington Post and Guardian began publishing stories based upon the “NSA Files” leaked by former NSA contractor Edward Snowden, the new tumblr has been met with a rather …skeptical reception online. Good to see this site called “IC on the Record” by @IContheRecord http://t.co/bXAfBWR8QS Should help counter the spin by the fear mongers. …the site won’t be enough, on its own. The considerable challenge that it and the intelligence community faces is the global climate of anger, fear and distrust that have been engendered by a summer of fiery headlines. Despite falling trust in institutions, people still trust the media more than the intelligence community, particularly with respect to its role as a watchdog. The launch of the website came with notable context. First, as the Associated Press reported, some of the documents released were made public after a lawsuit by the Electronic Frontier Foundation (EFF). In a significant court victory, the EFF succeeded in prompting the release of a 2011 secret court opinion finding NSA surveillance unconstitutional. It’s embedded below, along with a release on DNI.gov linked through the new tumblr. The opinion showed that the NSA gathered thousands of Americans’ emails before the court struck down the program, causing the agency to recalibrate its practices. The NSA subsequently released a statement disputing aspects of the Journal’s reporting, specifically the “the impression” that NSA is sifting through 75% of U.S. Internet communications, which the agency stated is “just not true.” The WSJ has not run a correction, however, standing by its reporting that the NSA possesses the capability to access and filter a majority of communications flowing over the Internet backbone. Reaction to the disclosures has fallen along pre-existing fault lines: critical lawmakers and privacy groups are rattled, while analysts point to a rate of legal compliance well above 99%, with now-public audits showing most violations of the rules and laws that govern the NSA coming when “roamers” from outside of the U.S.A. traveled to the country. Thousands of violations a year, however, even if they’re out of more than 240,000,000 made, is still significant, and the extent of surveillance reported and acknowledged clearly has the potential to have a chilling effect on free speech and press freedom, from self-censorship to investigative national security journalism. The debates ahead of the country, now more informed by disclosures, leaks and reporting, will range from increased oversight of programs to legislative proposals to update laws for collection and analysis to calls to significantly curtail or outright dissolve these surveillance programs all together. Given reports of NSA analysts intentionally abusing their powers, some reforms to the laws that govern surveillance are in order, starting with making relevant jurisprudence public. Secret laws have no place in a democracy. …so heavily redacted that media outlets can create mad libs based upon them. That’s the sort of thing that leads people to suggest that the NSA has no idea what ‘transparency’ means. Whether that’s a fair criticism or not, the approach taken to disclosing documents as images and PDFs does suggest that the nation’s spy agency has not been following how other federal agencies are approaching releasing government information. As Matt Stoller highlighted on Twitter, heavily redacted, unsearchable images make it extremely difficult to find or quote information. Along with leak investigations and prosecution of whistleblowers, drones and surveillance programs have been a glaring exception to federal open government efforts, giving ample ammunition to those who criticize or outright mock President Obama’s stated aspiration to be the “most transparent administration in history.” As ProPublica reported this spring, the administration’s open government record has been mixed. Genuine progress on opening up data for services, efforts to leverage new opportunities afforded by technology to enable citizen participation or collaboration, and other goals set out by civil society has been overshadowed with failures on other counts, from the creation of the Affordable Care Act to poor compliance with the Freedom of Information Act and obfuscation of the extend of domestic surveillance. Post all documents as plaintext, not images and PDFs that defy easy digestion, reporting or replication. While the intelligence budget is classified, surely some of those untold billions could be allotted to persons taking time to release information in both human- and machine-readable formats. Put up a series of Frequently Asked Questions, like the Wall Street Journal’s. Format them in HTML. Specifically address that reporting and provide evidence of what differs. Posting the joint statement on the WSJ stories as text is a start but doesn’t go far enough. Post audio and plaintext transcripts of conference calls and all other press briefings with “senior officials.” Please stop making the latter “on background.” (The transcript of the briefing with NSA director of compliance John DeLong is a promising start, although getting it out of a PDF would be welcome. Take questions on Twitter and at questions@nsa.gov or something similar. If people ask about programs, point them to that FAQ or write a new answer. The intelligence community is starting behind here, in terms of trust, but being responsive to the public would be a step in the right direction. Link out to media reports that verify statements. After DNI Clapper gave his “least untruthful answer” to Senator Ron Wyden in a Congressional hearing, these “on the record” statements are received with a great deal of skepticism by many Americans. Simply saying something is true or untrue is unlikely to be received as gospel by all. Use animated GIFs to communicate with a younger demographic. Actually, scratch that idea.